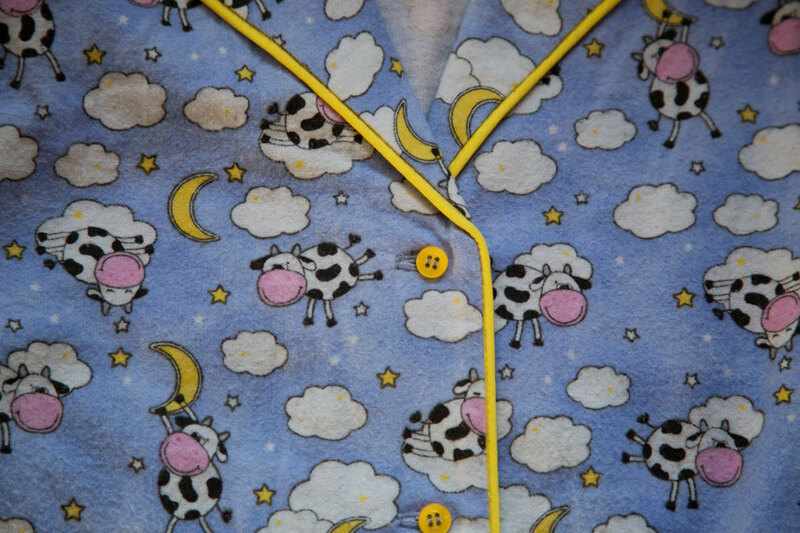 My second 2015 PJ set. I can now cross “flannel pajamas” off of my fall/winter projects list. Aside from piping the collar and front facing, I made no changes from last time. Once again I used a cotton flannel for my fashion fabric. I purchased this fabric over three years ago. Feels good to finally get it out of my stash. The interfacing for the collar and facings, as well as the 3/4″ elastic for the waistband, is from Fashion Sewing Supply. Piping is from Joanns. The yellow buttons are from Cleaners Supply. My only regret with this pair is the position of the buttonholes. I positioned them exactly as they were marked on the pattern, and I think they are just a little bit too far away from the edge. I used 3/8″ buttons; I think that the markings were for 1/2″ or 5/8″ buttons. 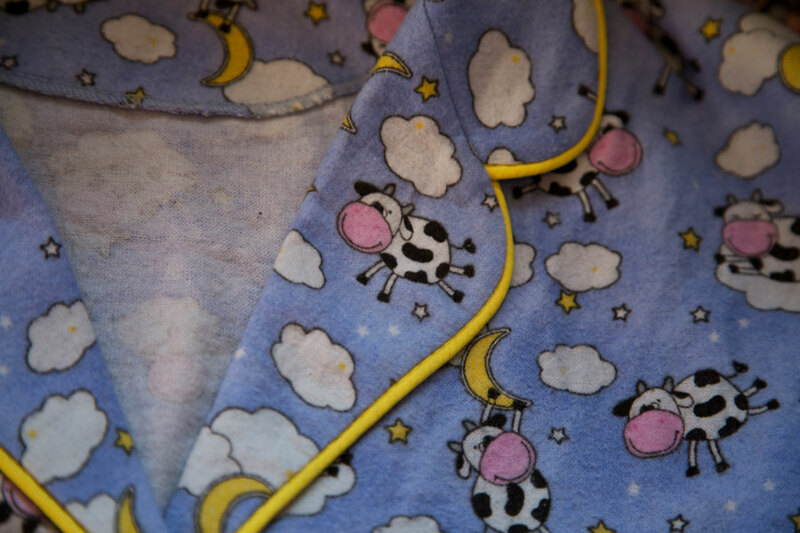 These pjs look so incredibly comfy and I love the whimsical cow print – adorable. So cute and comfortable. I’ve only used piping once so was particularly interested to see how you managed the piping at the collar seams. There’s tutorials out there (I bet Closet Case Files did one for her PJ pattern) and of course my favorite: referencing RTW. I did neither this time and instead just extended the piping for the facing about 1/2″ beyond the intersection point. It is hidden by the collar. It isn’t a street garment so I wasn’t concerned about perfection or being “correct”, mostly wanted to get it done as painlessly as possible. Cute PJ’s. I’m always nervous about purchasing flannel on-line due to quality uncertainty. Looks like you lucked out! It is something I just take chances with. I had one disappointment from fabric.com, but otherwise I’ve done pretty well with their flannel. My main issue with them is that there’s very few coupons anymore, and their prices are no longer competitive. I would also trust cotton flannel from Apple Annie Fabrics and Gorgeous Fabrics, but it seems like the type of fabric they don’t carry very often. I heard the flannel from Joann’s has gotten much better, but I’m still wary after making PJ bottoms out of their flannel that ripped at the crotch, holes, etc! Some of the best flannel I own is from Fabric Mart, but since they’re a value-oriented jobber their quality is all over the map. Same with Fashion Fabrics Club. Flannel and fashion are not words that are usually together in one sentence ; ) These are gorgeous – have you heard of http://www.peteralexander.com.au/shop/en/peteralexander/ ? Yours are better! Net-A-Porter currently has a cotton flannel shirt for $425 ;). I never heard of that retailer before…I cannot believe they charge $49 for flannel PJ bottoms…and that’s after the sale discount! It really pops against the blue, doesn’t it?